Prune is a game for iOS that was just released. I played it on iPad, so that’s the version I’m commenting on. The game was made by one Joel McDonald, who doesn’t have a track record as a game developer yet as far as I can tell. It’s well made, looks beautiful, and is my iOS Game Pick of the Week. This entry was posted in Games on 2015/08/04 by omu. Update 15/08/06 – I’ve added a few more games to the list. Between AAA publishers and small indie studios, it seems to me there are more games in the making out there than ever before. I’ve piled up so many links to interesting games over the past months, I’m starting to lose track. So here’s a list, in no particular order. Some of these are in concept stage, some in alpha, beta, and some in early access. I’ve not played any of these yet. Maybe I’ll come back and revise the list once in a while when stuff gets released, maybe not. The Witness – the new game by Jonathan Blow, hopefully out soon. I’ve been looking forward to this mostly for the concept, even though it is also a very beautiful game. The gaming world desperately needs more exciting new gameplay concepts most of all, so I’m hopeful that Blow and his team deliver with this one. Tom Clancy’s The Division – seems they are trying to do something very dynamic with Player vs. Player vs. Environment here. The concept looked pretty cool judging purely from this E3 gameplay presentation that I saw, I’m looking forward to this. No Man’s Sky – obviously. Ever since the beautiful Edge magazine cover a while ago, I’m waiting for this one to get released. Recently, I stumbled upon a set of posts on PC gaming blog Rock, Paper, Shotgun called Gaming Made Me. These stories, written by the authors of RPS and quite a few guest authors connected to the games business, brought back many memories about my own history in gaming and a huge sense of nostalgia. Thinking about which games made me the gamer I am today, I decided to follow suit and write my own story. This is the first part of this story, and I’m going to touch on one of the earliest games I played, roundabout 20 years ago. My father owned an IBM personal computer back then. It came equipped with an 8088 processor and a monochrome Hercules Graphics Card, running MS-DOS from a 10 MB harddrive. I distincly remember having to tweak DOS bootdisks in order to be able to run some of the games I played, but that’s a completely different story. Aside from the obvious (Pacman, anyone? ), there’s one game in particular that I want to mention here. Today, one of my favourite game genres is RPGs, Role-Playing-Games. (You should read this article over on Gamasutra if you’re interested in the development of the RPG genre in general.) I owe this fascination to no small degree to one game which I played on my father’s old machine: Wizardry VI: Bane of the Cosmic Forge. Where could this staircase lead? In Bane, the player controls a party of up to six characters in first-person perspective during their voyage through a three-dimensional world. The party embarks on a quest to retrieve the Cosmic Forge, a quill which can be used by its wielder to control time and space, from an abandoned castle full of monsters, traps and treasure. The whole game world is based on square tiles, and the party moves around in the four cardinal directions, one tile at a time. Some tiles are guarded by monsters, and upon stepping on such a tile, turn-based combat ensues. Other tiles hold, among other things, treasure chests, doors that have to be unlocked or deadly traps that need to be disarmed. From today’s perspective, the game will seem awfully crude to most (younger) gamers. Pixelated graphics, whacky animations, and beeping sounds. For me, it was a revelation. I would play the game for hours, thrilled by the possibilities of exploring this mysterious world, fantasizing about the secrets I might uncover. The game didn’t feature an automap, so I would draw elaborate maps on graph paper, annotating every nook and cranny I came across. With a smile I remember my surprise upon meeting a creature that would not actually attack me on first sight but rather try to engage in conversation and offer to sell some strange items which would help me on my quest. Looking back, it was mostly the suspense about what I might find in the game’s huge world, and not so much the things I actually did encounter, that made up the immense fascination: there was enough room for my own fantasies. The graphics weren’t such a big deal either. This was long before “real” 3D engines and high resolution artwork. Nowadays the game might look bad in comparison: but when I played it I simply couldn’t imagine anything better. Back then, I didn’t really understand the plot of the game, not to speak of the many smaller stories and sometimes rather difficult puzzles the game had to offer, and I never finished it. 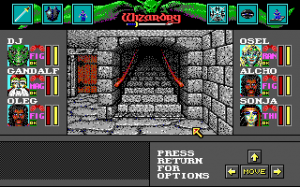 Nevertheless, Wizardry VI, the game that introduced me to computer RPGs, made a deep impression on me at the time and I still remember it fondly today. This entry was posted in Games and tagged Computers, Games on 2009/07/27 by omu. Welcome to Omuraisu. This is my personal website and my playground for experiments in web design and development. Every once in a while, I will add some new content or technology - but don't expect regular updates. Browse at your leisure.